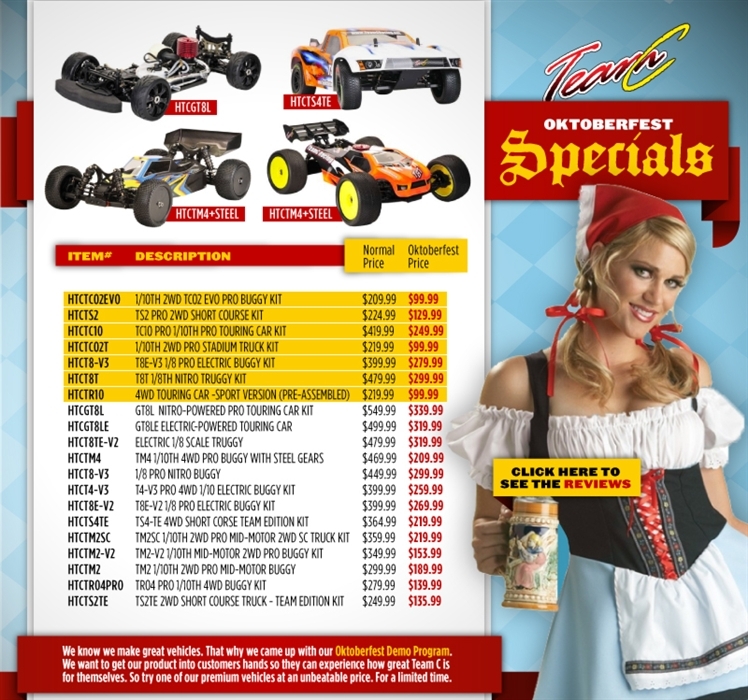 Big Team C Sale at HRP Oktoberfest « Big Squid RC – RC Car and Truck News, Reviews, Videos, and More! Just in time for indoor season, HRP is a having a huge sale on Team C products. During their Oktoberfest Sale you can get some pretty big savings on just the type of products that you would be racing indoors, or bashing outside. For example, the latest high-zoot 1/10th 2wd buggy from Team C is the mid-motored TC02C Evo. They normally sell for $209 but are Oktoberfest priced at just $99. To check out all the Team C specials simply hit up This Link. Want more Team C news? Find it Right Here on BigSquidRC.